Somehow it’s already the last day of January. How did I miss the other 30 days? It seems like it was just yesterday that I was busy making New Years Eve Malted Milk Ball cupcakes! Much of my month was hijacked (and i use that term in the most endearing of ways) by a little well-known girl by the name of Scout (pictured above). 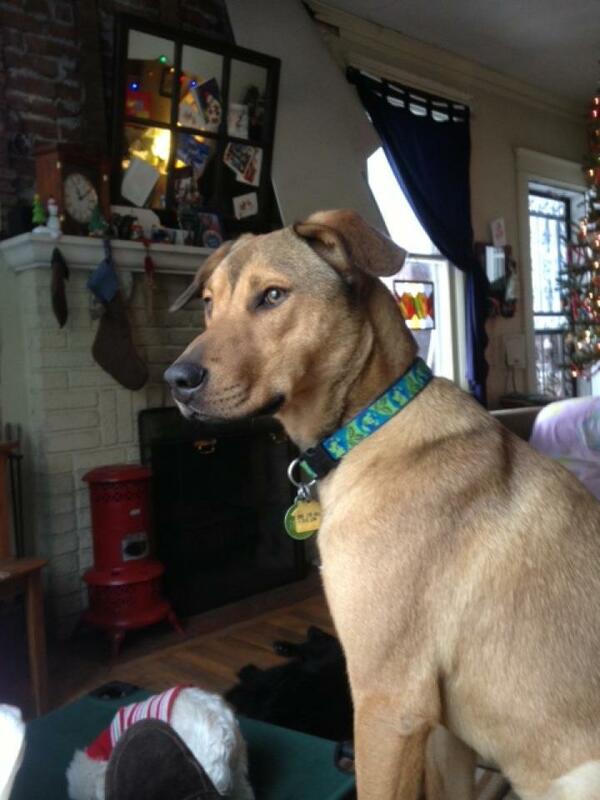 Scout went missing on January 19th and spent 12 days on the road. During these 12 days, I did little of anything that was normal. Instead I woke up at weird hours of the night to spread chicken through the streets of Midtown, ate most of my meals in my car, worked “trap shifts”, ran on the railroad tracks, and slept very little. Also, during our “Scouting”, as we fondly started to refer to our antics, we also rescued a puppy, Tallulah. Whew! I guess that’s why I’m surprised that it’s the end of January. Read Books: In 2013, I have already read a non fitness related book, The Happiness Project. Woo hoo! This is definitely a step in the right direction in my quest for not only reading work related books. Vacation: I wish I could say I’ve already vacationed in 2013 but sadly, i have not. We will be out of town soon for a race..not sure that counts but i’m still working on getting a decent vacation planned for the year. Journal: Journaling can be so intimidating because you feel like you have to really write a journal. I found the perfect compromise (thanks, Erin)! The Happiness Project 5 Year Journal- there’s only enough space each day for about 2 or 3 sentences. It has been great. I journal every night and there is zero pressure. Yoga: I’ve been doing yoga twice a week at home. I must admit though that I didn’t even get one practice in last week and have yet to this week BUT i will certainly make it happen this weekend. Do a race outside my comfort zone: Um, that would totally be Swampstomper a few weeks ago! Plant a small garden: Although it’s not gardening time yet, I am taking care of my first house plant and it is still ALIVE! Try a new recipe at least monthly: Who knows. I don’t even know what I ate for breakfast today, how in the hell am I supposed to remember if I made something new this month. Hug: This one makes me laugh, cry, and smile. This month, more than any I’ve had as of late, has warranted lots of hugs. We’ve had sad hugs and celebration hugs. So, I think I’ve done pretty darn good with my first month of my Mental Health 2013. How are your resolutions coming along?? OH, and the great news is that Scout was found by a sweet man who worked for several days to earn her trust and finally was able to read her tags AND sweet little Tallulah has a new home too. Now, I’d be lying if I didn’t say this one has pretty much devastated me (cue: sad hugs) but I’m still thrilled we saved her from the craziness of Lamar Ave.